It has not been a good week for nail art. And I really can’t focus on my nails this month anyway because I’m going to a steampunk convention. I’ve been trying to get an outfit a day together, which means lacing myself into my corsets as often as possible to finish breaking them in properly. This tends to maul freshly painted nails so I put off painting them until it’s too late and I have to go to bed. Tomorrow I’m also going to be working on making some jewelry to go with the outfits. That’s always great for not destroying a manicure. Hah! And I’m so close to finishing my big ol’ wings for a Princess Luna (from My Little Pony Friendship is Magic) that I may do that as well. So it may be a bit before I post yellow. I didn’t mean to skip it. I just wanted matching hands when I went to a wedding today and the green looked better with what I was wearing. I only used two polishes for this (Essie’s “Off Tropic”, ILNP’s “Gaia”, Blueness swan charms) so I didn’t take a photo. 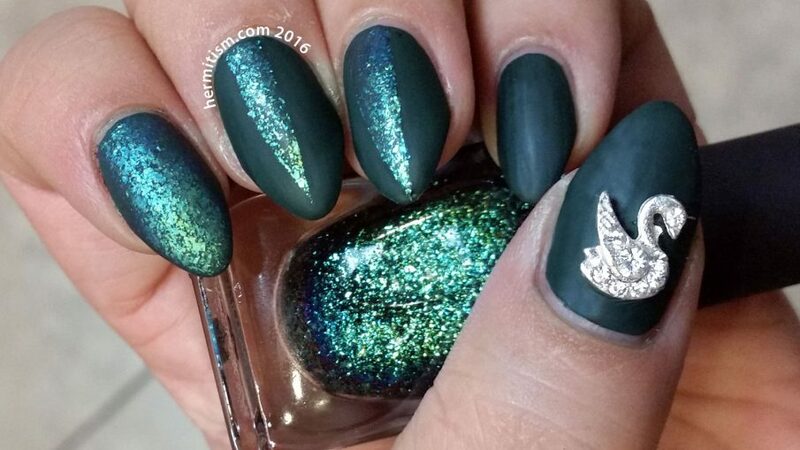 Pretty simple manicure: throw down your base coat (the Essie, which will probably be a one-coater after a few uses thickens it up a titch more), top coat it, use masking tape to make your triangles and go crazy with the ILNP, top coat, matte top coat, add swan charm, done. Or in my version of done, break off the tip of a nail while you’re washing your hands. Seriously, world? Luckily it was my right hand and I usually photograph the left. Ooohh so pretty! 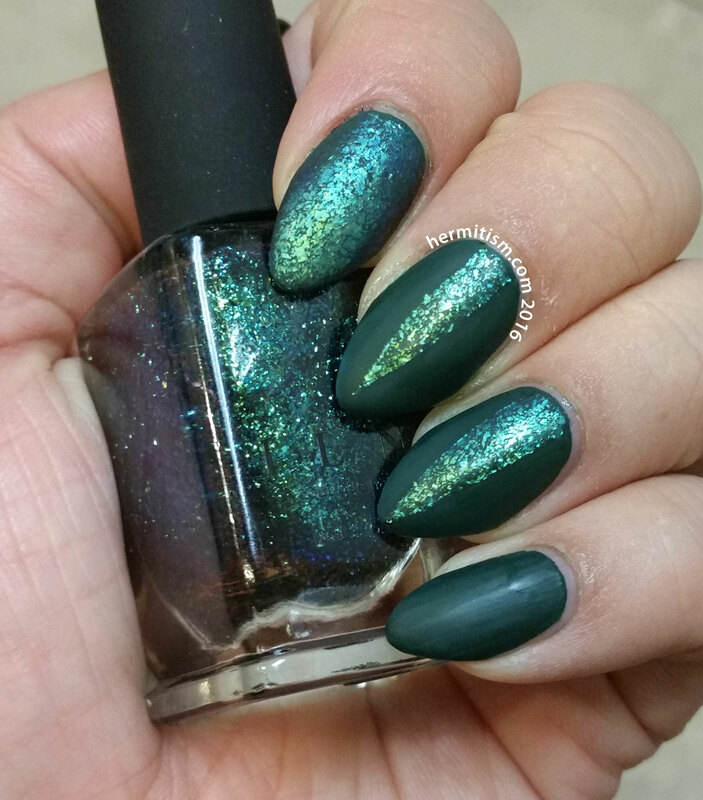 I love that deep green shade and the glitter over the top is very elegant.